Good morning! It’s a quiet unseasonably cool morning here in central Arkansas and I’m enjoying it. We had a beautiful thunderstorm last night complete with a majestic lightening display. No storm damage so all is well! 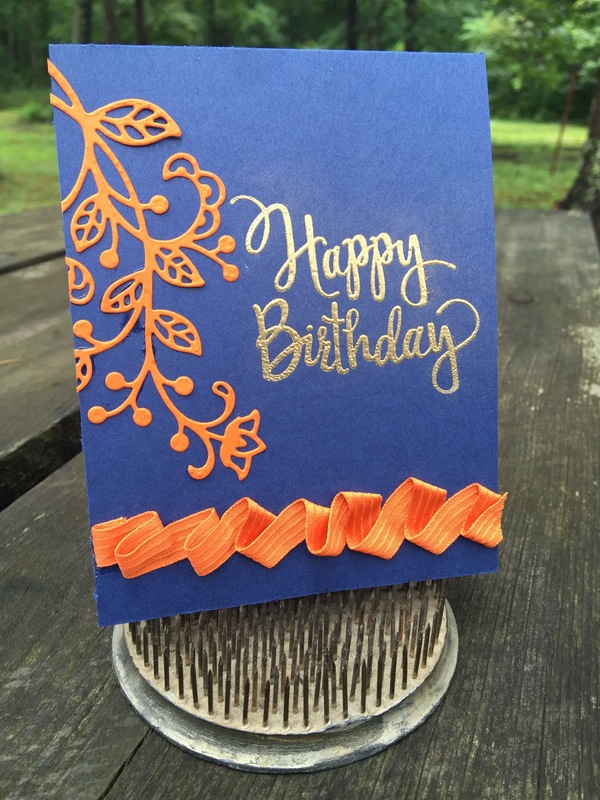 This morning I wanted to share a simple birthday card using the new Stylized Birthday stamp and the Flourish thinlets from Stampin’ Up. It didn’t take any time to throw this quick card together and I really like the color combo of Night of Navy and Tangelo Twist. It has a nice modern feel. I used gold embossing powder for the sentiment and love the added texture. I also used the fine tip glue pen to adhere the die cut to the card top. It’s fantastic for all those intricate cuts. I challenge you to make something crafty today! Enjoy your friends and family and come back here to post what you made! I would love to see and hear from you. So how will you spend your weekend?